D.C. police have released new numbers showing a spike in bias-related crimes against people for their sexual orientation or gender identity, their religion, their nationality or ethnicity. News4's Mark Segraves breaks down the numbers and reports on the pledge by District leaders to crack down on these crimes. A dramatically higher number of hate crimes were reported in Washington, D.C. in the past year, officials said at a news conference Friday morning. In 2015, 66 bias-related crimes were reported. In 2016, 107 were reported, marking a 62 percent increase. These crimes run contrary to D.C. values, Acting Police Chief Peter Newsham said. "We will not accept this as the new norm," he said. Reports of crimes based on bias related to ethnicity/national origin rose most sharply, from 3 incidents in 2015 to 12 incidents in 2016, marking a 300 percent increase. Crimes based on religion had the second-highest increase, with 5 incidents in 2015 and 18 incidents in 2016, the data shows. Of the religious-bias-related crimes, 12 of the 18 were against the Jewish community, Newsham said. "I would love to say I'm surprised," said Rabbi Batya Steinlauf. "I'm not surprised. The Jewish community has been well aware of the undercurrents of anti-Semitism." Newsham attributed the increase to a possible increase in awareness about hate crimes, a rise in reporting and national issues. "It could be because people have become more emboldened because of some of the things that we've seen nationally," the police chief said, without getting more specific. Mayor Muriel Bowser said officials will continue to work to keep everyone safe. “My administration will continue fostering a culture that encourages people to come forward when they are the victim of discrimination or a bias-related crime because, in order to properly address these issues, we need everyone to feel safe reporting them," she said in a statement. Steinlauf said she is encouraged by the mayor's efforts. "So that we can stand together to make it clear that this is not what our society is about, this is not what District of Columbia is about, this is not what the community is about," Steinlauf said. "We stand together." Overall crime in D.C. has decreased by 9 percent in the past two years. North of the city, Montgomery County, Maryland also saw a big increase in hate crimes from 2015 to 2016, with a 42 percent spike. 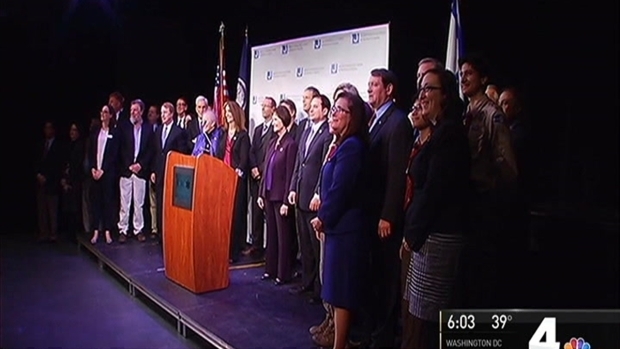 Elected officials and faith leaders met in Fairfax County, Virginia, and Montgomery County, Maryland, on Friday amid a rash of threats and hate crimes. "We're going to use every resource we can to bring those people who are causing these crimes to justice," Maryland Sen. Ben Cardin said. News4's Chris Gordon reports. Montgomery County Council President Roger Berliner attributed the spike to President Donald Trump's campaign. "The spike in hate crimes was a direct correlation to the kind of campaign that was run for the president of the United States. It unleashed an energy that is very destructive," he said last month.